D. Located to left of arrowhead on reverse. Philadelphia Mint pieces lack mint mark. D, O, S. Located to left of arrowhead on reverse. Philadelphia Mint pieces lack mint mark. Native American male in headdress. The Indian Head gold pieces or Pratt-Bigelow gold coins were two separate coin series, identical in design, struck by the United States Mint: a two-and-a-half-dollar piece, or quarter eagle, and a five-dollar coin, or half eagle. The quarter eagle was struck from 1908 to 1915 and from 1925–1929. The half eagle was struck from 1908 to 1916, and in 1929. The pieces remain the only US circulating coins with recessed designs. These coins were the last of their denominations to be struck for circulation, ending series that began in the 1790s. President Theodore Roosevelt, from 1904, vigorously advocated new designs for United States coins, and had the Mint engage his friend, the sculptor Augustus Saint-Gaudens, to design five coins (the four gold pieces and the cent) that could be changed without congressional authorization. 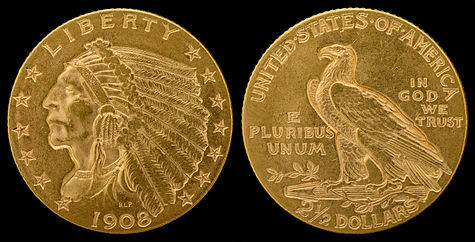 Before his death in August 1907, Saint-Gaudens completed designs for the eagle ($10 piece) and double eagle, although both required subsequent work to make them fully suitable for coining. With the eagle and double eagle released into circulation by the end of 1907, the Mint turned its attention to the half eagle and quarter eagle, originally planning to duplicate the double eagle's design. The Mint had difficulty fitting the required inscriptions on the small gold coins. 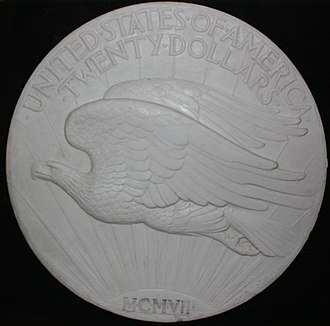 President Roosevelt, in April 1908, convinced Mint Director Frank Leach that it would be a better idea to strike a design similar to that of the eagle, but below the background, to secure a high-relief effect. Such coins were designed by Boston sculptor Bela Lyon Pratt at the request of the President's friend, William Sturgis Bigelow. After some difficulty, the Mint was successful in this work, though Pratt was unhappy at modifications made by the Mint's engravers, headed by longtime Chief Engraver Charles E. Barber. The two pieces were struck until World War I caused gold to vanish from circulation, and then again in the late 1920s. 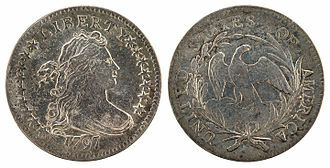 Neither coin circulated much; the quarter eagle saw popularity as a Christmas present. In 1933, President Franklin Roosevelt stopped the issuance of gold in coin form, and recalled many pieces which were in private or bank hands. For additional detail on the origin of the idea for the 1907–1908 United States gold coin redesign, see Saint-Gaudens double eagle § Inception, and Indian Head eagle § Inception. In 1904, US President Theodore Roosevelt complained about the artistic quality of American coinage to his Secretary of the Treasury, Leslie Mortier Shaw, and asked if it were possible to hire a private sculptor such as the President's friend Augustus Saint-Gaudens to give modern, artistic designs to US coins. At Roosevelt's instigation, Shaw had the Mint (part of the Department of the Treasury) hire Saint-Gaudens to redesign five denominations of US coinage that could be changed without an Act of Congress: the cent and the four gold pieces (the quarter eagle, half eagle, eagle and double eagle). 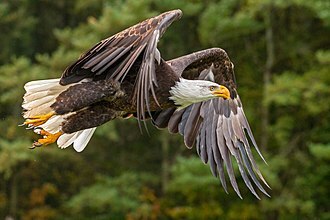 By the Mint Act of 1792, an "eagle" was made equivalent to ten dollars. Mint officials originally assumed that whatever design was selected for the double eagle would simply be scaled down for the three lower denominations. In May 1907, however, President Roosevelt decided that the eagle and double eagle would bear very different designs, a departure from past practice. In August (the month of Saint-Gaudens' death from cancer), outgoing Mint Director George E. Roberts wrote, "no instructions have been received from the President as to the half and quarter eagle, but I expected that the eagle design would be used upon them". After considerable difficulties, the Mint issued the eagle and double eagle based on Saint-Gaudens' designs later that year. The eagle featured Liberty wearing an Indian headdress on the obverse and a perched bald eagle on the reverse; the double eagle featured Liberty striding forward on the obverse and a flying eagle on the reverse. Due to the difficulties with the two larger coins, little attention was given to the half eagle and quarter eagle until late 1907. 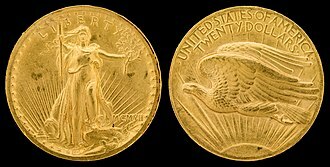 On November 28, 1907, Treasury Secretary George Cortelyou wrote in a letter that the double eagle design was to be used for the two small gold pieces. On December 2, Mint Director Frank Leach instructed the Philadelphia Mint to prepare coinage dies for the small pieces, using the double eagle design. Chief Engraver Charles E. Barber replied a week later that it would be difficult to put all the legends that were required by law on the new pieces, such as the name of the country. On the double eagle, "E Pluribus Unum" is placed on the edge, an impractical setting on pieces about the size of the nickel and dime. Philadelphia Mint Superintendent John Landis forwarded Barber's letter to Leach with his own note, stating, "I know it will be difficult to put the inscription 'E Pluribus Unum' on the periphery of a quarter eagle, but I do not see where else it can [go] and we must try to do it". Barber was assigned the task of solving these difficulties. He planned to use his low-relief version of Saint-Gaudens' double eagle design, but he made slow progress on the assignment. Leach wrote to Saint-Gaudens' attorney to ask if the sculptor's assistant Henry Hering could do the work. Hering was willing, and asked for enlarged models of the double eagle designs. Barber opposed bringing in outsiders, citing delays in the preparation of the earlier gold coin designs which he attributed to the Saint-Gaudens studio: "it is entirely unnecessary to trouble Mr. Hering any further, unless another year is to be wasted in vain endeavor". On January 3, 1908, Leach wrote to Hering to inform him that all work would be done by the Mint. The President's friend, Dr. William Sturgis Bigelow, had been in Japan for most of 1907; on his return to his Boston home he heard about the Saint-Gaudens coinage from Senator Henry Cabot Lodge. Bigelow was one of a number of Roosevelt's friends given early specimens of the double eagle. He wrote to the President on January 8, 1908, praising the Saint-Gaudens coins and stating that he was working with a Boston sculptor, Bela Pratt, on an idea that would allow coins to be struck in high relief. Pieces struck in this manner would have the designs protected from wear and be able to stack easily (both problems with high relief coins). The President responded to express his interest on January 10, and Pratt was soon busy on a model for him to examine. Roosevelt did not then tell the Mint of the new proposal. 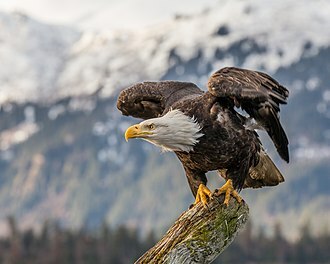 The newly released eagle and double eagle had provoked considerable controversy over their omission of the motto "In God We Trust", and with Congress already preparing to require the motto's use, Leach ordered work suspended on the half and quarter eagle on January 18. The Mint had not expected to have to put "In God We Trust" on small coins of the double eagle design, on which it was already having trouble finding space for the other required legends. On the assumption the bill would succeed, Leach had Barber continue with his work, and at least one pattern half eagle was struck on February 26 for Leach to show the President. Originally it was the intention to give the $5 and $2.50 pieces the same design as that used on the double eagle or $20 piece, but before final action to that end was taken President Roosevelt invited me to lunch with him at the White House. His purpose was to have me meet Doctor William Sturgis Bigelow of Boston, a lover of art and friend of the President, who was showing great interest in the undertaking for improving the appearance of American coins, and who had a new design for the smaller gold coins. It was his idea that the commercial needs of the country required coins that would "stack" evenly, and that the preservation of as much as possible of the flat plane of the piece was desirable. A coin, therefore, with the lines of the design, figures, and letters depressed or incused, instead of being raised or in relief, would meet the wishes of the bankers and business men, and at the same time introduce a novelty in coinage that was artistic as well as adaptable to the needs of business. As a result of the White House lunch meeting, Leach agreed to abandon the idea that the double eagle design be used for the small gold pieces, and to cooperate with Bigelow and Pratt in the making of the new coins. Leach even undertook to reimburse Pratt's fee of $300 to Bigelow from government funds. The President wanted to see Saint-Gaudens' standing eagle from the ten-dollar piece adapted in a recessed surface for the smaller pieces, and, if it did not constitute a change of design, used on the ten-dollar piece as well (a project that did not go beyond the talking stage). Bigelow wrote to Pratt on May 1 after conferring with Leach, stating that the Mint Director would likely not object if Pratt were to improve Saint-Gaudens' standing eagle, but "I would not, if I were you, get too far from the original, as the President likes it. Perhaps you can make him like it better." I desire that this shall be accomplished as soon as possible as I am under obligation to the President to have several thousand pieces coined by the first of November next and I want enough half eagle dies prepared so that a couple of pairs at least can be supplied [to] Denver and San Francisco. The quarter eagle will be coined only at your institution. After production of the new coins began, Bigelow received one of each; he showed them to Pratt who wrote to his mother, "They have 'knocked spots' out of my design at the mint. They let their die cutter spoil it, which he did most thoroughly ... but they tried to retouch it and gee! They made a mess of it. With a few deft strokes the butcher or blacksmith [Barber] who is at the head of things there, changed it from a thing that I was proud of to one [of which] I am ashamed." The half eagle and quarter eagle are identical in design, and are unique in American coinage in having incuse (engraved, as opposed to bas-relief) designs. The obverse features the head of a Native American man, wearing a headdress and facing left. The designer's initials, BLP, are found just above the date. The reverse features a standing eagle on a bunch of arrows, its left talon holding an olive branch in place. The mint mark is found to the left of the arrowheads. Although Saint-Gaudens' design for the eagle had featured Liberty in an Indian-style headdress, no attempt was made to make her features appear to be Native American. According to numismatist Mike Fuljenz in his book on early 20th century American gold coinage, the obverse of the eagle had featured "Lady Liberty topped with a fanciful head covering designed to look like an Indian headdress". Until Saint-Gaudens' and Pratt's pieces were struck, only Mint Chief Engraver James Longacre had attempted to depict Indians on US circulating coinage (in the 1850s), with his Indian Head cent and Indian Princess designs for the gold dollar and three-dollar pieces. After Pratt, only James Earle Fraser's depiction of an Indian in 1913 on the Buffalo nickel would appear until the 2000 arrival of the Sacagawea dollar. Art historian Cornelius Vermeule in 1970 dismissed complaints made at the time of issuance that the Indian was too thin: "the Indian is far from emaciated, and the coins show more imagination and daring of design than almost any other issue in American history. Pratt deserves to be admired for his medals and coins." Vermeule suggests that Pratt's design "marked a transition, in the 'emaciated' Indian at least, to naturalism". Breen suggests the sunken surfaces were similar to those on coins from Egypt's Fourth Dynasty. Under the Mint Act of 1792, the obverse was to bear an "impression emblematic of Liberty"; he notes that a Native American on the obverse was particularly appropriate "for after all the Indians were free peoples before the white man's laws made them third-class citizens" and suggests that Pratt's eagle, before it was modified by Barber, was "worthy of J.J. Audubon". Dies for the half eagle were sent to the mints in Denver and San Francisco; both western mints reported difficulties in striking the new pieces. 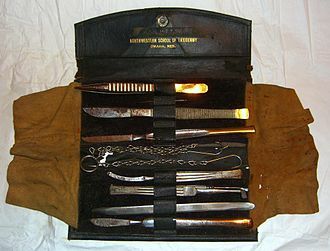 Landis wrote to his counterparts at the other mints, advising them that the planchets, or blanks, needed to be shaved very slightly to strike properly. The new coins proved to be thinner than earlier coins of their denomination, due to the field being raised above the design. This meant that automated sorting machines could not reliably sort them when mixed with earlier coins. The new gold pieces entered circulation in early November 1908, attracting some negative comment. Philadelphia numismatist Samuel Chapman wrote to Roosevelt in early December to criticize the new coins. The indentations in the new coins would harbor dirt and germs, Chapman argued; the coins could be easily counterfeited by carving a disc of metal. They could not adequately stack, and they were in any event not handsome, with the Indian "emaciated". According to numismatic historian Roger Burdette, "Chapman's letter caused some consternation at the White House". The President prepared a reply in which he expressed himself strongly to Chapman, but Bigelow persuaded him to substitute a milder letter over Bigelow's signature, defending the new coins. Bigelow's letter replied to Chapman's complaint about the Indian, "The answer to this is that the head was taken from a recent photograph of an Indian whose health was excellent. 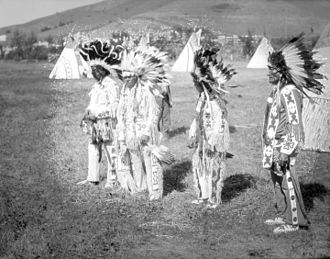 Perhaps Mr. Chapman has in mind the fatter but less characteristic type of Indian sometimes seen on the reservations." Chapman wrote again, and had the correspondence published in the numismatic press, but no one at the lame duck Roosevelt White House bothered to reply, according to Burdette, "the new coins were issued and would remain as they were for twenty-five years, or until Congress ordered them changed". Leach wrote to Bigelow on January 2, 1909, "I was somewhat amused by their savage attack, and should have liked to have been in a position to reply to this unjust criticism. However, I am pleased to say that adverse criticism of the coins is an exception. I feel very well pleased with the result." Both the half and quarter eagle were struck each year through 1915. While "hard money" circulated in quantity in the West, in the East banknotes were much more common. A common use of the small gold pieces was as Christmas presents—the pieces would be produced at the various mints late in the year, be purchased from banks in December and return to vaults by late January. The establishment of the Federal Reserve System in 1913 increased the circulation of banknotes, and the Mint ceased to strike quarter eagles after 1915 and half eagles after 1916. 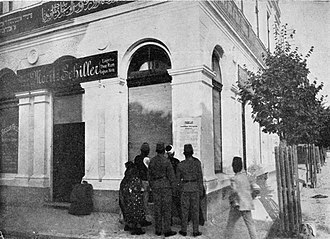 An additional factor was the economic unrest caused by World War I, causing gold prices to rise and coins made of that metal to vanish from circulation. After the war, gold did not return to circulation, and most gold coins struck were double eagles, used for international transactions and backing for gold certificates. The quarter eagle remained popular as a Christmas gift but did not initially come back into production as the Treasury held stocks of the pieces from the prewar years. 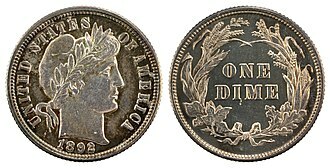 This surplus was slow to dissipate, as gift givers preferred the older Liberty Head quarter eagle that had been struck until 1908. With the Liberty Head pieces becoming rarer and acquiring a premium above face value, the quarter eagle was finally struck again in 1925, principally to be given as presents. The 1925 quarter eagle was struck only at Denver, and it was then struck from 1926 to 1929 only at Philadelphia. With the economic collapse which started the Depression, the quarter eagle was not called for in commerce, and the Mint halted production. The half eagle was not struck again until 1929, at Philadelphia. Coins of that date have a rarity not reflected in the mintage of 668,000 as few entered commerce. Gold coins not released were melted in the mid-1930s, along with those recalled from banks and private holders, after President Franklin Roosevelt ended the issuance of gold coins in 1933. Roosevelt's actions put an end to the quarter and half eagle series, which had begun in 1796 and 1795, respectively. There are only 15 different Indian Head quarter eagles by date and mintmark; the key is the 1911 struck at Denver (1911-D), which the 2014 A Guide Book of United States Coins values at $2,850 even in well-circulated VF (Very Fine, or 20 on the Mint State scale) condition. The half eagle series is longer; 24 pieces by date and mint mark. The final entry, 1929 is the key date for the half eagle series, followed by the 1909-O, struck at the New Orleans Mint in its final year of operation. ^ Moran 2008, p. 216. ^ Moran 2008, p. 235. ^ Burdette 2006, pp. 317–318. ^ Burdette 2006, p. 105. ^ Burdette 2006, pp. 106–107. ^ Hobson 1971, pp. 159–160. ^ Burdette 2006, p. 318. ^ Burdette 2006, pp. 318–319. ^ a b Burdette 2006, p. 321. ^ Burdette 2006, pp. 324–326. ^ Burdette 2006, p. 196. ^ Burdette 2006, pp. 326–328. ^ Leach 1917, p. 381. ^ Burdette 2006, p. 329. ^ Burdette 2006, p. 330. ^ Burdette 2006, pp. 331–332. ^ a b c Burdette 2006, p. 333. ^ Burdette 2006, pp. 334–335. ^ Burdette 2006, p. 368. ^ Burdette 2006, p. 339. ^ a b Yeoman 2013, p. 264. ^ Akers 2008, pp. 10–11. ^ a b Fuljenz 2010, p. 16. ^ a b Vermeule 1971, p. 121. ^ Breen 1988, p. 502. ^ Burdette 2006, p. 344. ^ Taxay 1983, p. 326. ^ Taxay 1983, pp. 326–328. ^ Burdette 2006, p. 358. ^ a b Burdette 2006, pp. 358–359. ^ Fuljenz 2010, p. 9. ^ Burdette 2006, p. 360. ^ a b Fuljenz 2010, p. 11. ^ Bowers 2004, p. 240. ^ Lange 2006, p. 164. ^ a b Yeoman 2013, p. 249. ^ Akers 2008, p. 122. ^ Yeoman 2013, pp. 243, 253. ^ Lange 2006, p. 165. Akers, David W. (2008). A Handbook of 20th Century Gold Coins, 1907–1933 (2nd ed.). Irvine, Cal. : Zyrus Press. ISBN 978-1-933990-14-9. Bowers, Q. David (2004). A Guide Book of Double Eagle Gold Coins. Atlanta, Ga.: Whitman Publishing. ISBN 978-0-7948-1784-8. Burdette, Roger W. (2006). Renaissance of American Coinage, 1905–1908. Great Falls, Va.: Seneca Mill Press L.L.C. ISBN 978-0-9768986-1-0. Fuljenz, Mike (2010). Indian Gold Coins of the 20th Century. Lumberton, Tex. : Subterfuge Publishing. ISBN 978-0-9819488-9-8. Leach, Frank (1917). Recollections of a Newspaperman. San Francisco, Cal. : S. Levinson. Moran, Michael F. (2008). Striking Change: The Great Artistic Collaboration of Theodore Roosevelt and Augustus Saint-Gaudens. Atlanta, Ga.: Whitman Publishing. ISBN 978-0-7948-2356-6. Yeoman, R. S. (2013). A Guide Book of United States Coins (The Official Red Book) (67th ed.). Atlanta, Ga.: Whitman Publishing. ISBN 978-0-7948-4180-5. Article in February 1909 The Numismatist discussing the new gold pieces and containing the Chapman correspondence. 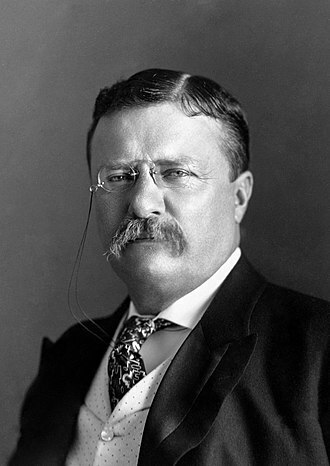 Theodore Roosevelt Jr. was an American statesman, explorer, soldier and reformer who served as the 26th president of the United States from 1901 to 1909. 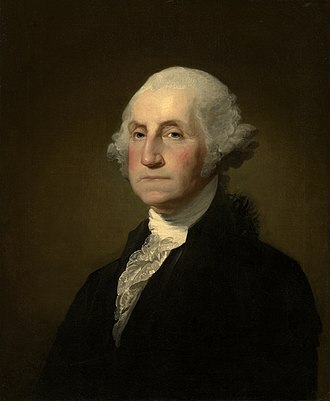 As a leader of the Republican Party during this time, he became a force for the Progressive Era in the United States in the early 20th century. Born a sickly child with debilitating asthma, Roosevelt successfully overcame his health problems by embracing a strenuous lifestyle and he integrated his exuberant personality, vast range of interests, and world-famous achievements into a cowboy persona defined by robust masculinity. Home-schooled, he began a lifelong naturalist avocation before attending Harvard College and his first of many books, The Naval War of 1812, established his reputation as both a learned historian and as a popular writer. Upon entering politics, he became the leader of the faction of Republicans in New Yorks state legislature. 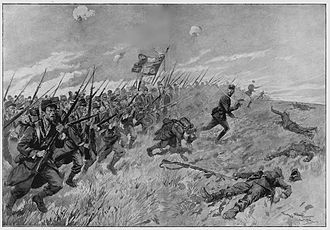 Returning a war hero, he was elected governor of New York in 1898, the state party leadership distrusted him, so they took the lead in moving him to the prestigious but powerless role of vice presidential candidate as McKinleys running mate in the election of 1900. 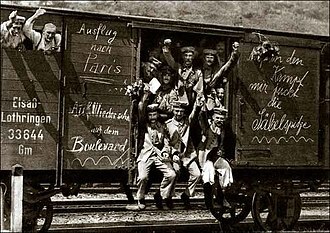 Roosevelt campaigned vigorously across the country, helping McKinleys re-election in a victory based on a platform of peace, prosperity. Following the assassination of President McKinley in September 1901, Roosevelt succeeded to the office at age 42, making conservation a top priority, he established a myriad of new national parks and monuments intended to preserve the nations natural resources. In foreign policy, he focused on Central America, where he began construction of the Panama Canal and he greatly expanded the United States Navy and sent the Great White Fleet on a world tour to project the United States naval power around the globe. His successful efforts to end the Russo-Japanese War won him the 1906 Nobel Peace Prize, elected in 1904 to a full term, Roosevelt continued to promote progressive policies, but many of his efforts and much of his legislative agenda were eventually blocked in Congress. Roosevelt successfully groomed his close friend, William Howard Taft, to succeed him in the presidency, after leaving office, Roosevelt went on safari in Africa and toured Europe. Returning to the United States, he became frustrated with Tafts approach, failing to win the Republican presidential nomination in 1912, Roosevelt founded his own party, the Progressive, so-called Bull Moose Party, and called for wide-ranging progressive reforms. The split among Republicans enabled the Democrats to win both the White House and a majority in the Congress in 1912, Republicans aligned with Taft nationally would control the Republican Party for decades. Frustrated at home, Roosevelt led an expedition to the Amazon basin. 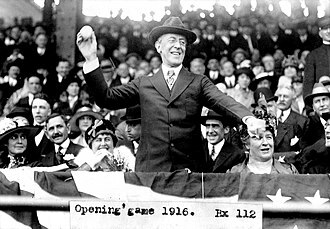 During World War I, he opposed President Woodrow Wilson for keeping the country out of the war, and offered his military services, although planning to run again for president in 1920, Roosevelt suffered deteriorating health and died in early 1919. Roosevelt has consistently ranked by scholars as one of the greatest American presidents. Historians admire Roosevelt for rooting out corruption in his administration, but are critical of his 1909 libel lawsuits against the World and his face was carved into Mount Rushmore, alongside those of George Washington, Thomas Jefferson, and Abraham Lincoln. In God We Trust is the official motto of the United States. In God We Trust first appeared on U. S. coins in 1864 and has appeared on paper currency since 1957. A law passed in a Joint Resolution by the 84th Congress and this phrase was first used on paper money in 1957, when it appeared on the one-dollar silver certificate. The first paper currency bearing the phrase entered circulation on October 1,1957, the 84th Congress passed legislation, signed by President Eisenhower on July 30,1956, declaring the phrase to be the national motto. It is the motto of the U. S. state of Florida and its Spanish equivalent, En Dios Confiamos, is the motto of the Republic of Nicaragua. The phrase appears to have originated in The Star-Spangled Banner, written by Francis Scott Key during the War of 1812, the fourth stanza includes the phrase, And this be our motto, In God is our Trust. This version of the made a early appearance on the twenty dollar interest bearing notes issued in 1864 along with the motto God. At least part of the motivation was to declare that God was on the Union side of the Civil War, chase chose his favorite designs and presented a proposal to Congress for the new designs in late 1863. This meant that the mint could make no changes without the enactment of legislation by the Congress. Such legislation was introduced and passed on April 22,1864, an Act of Congress passed on March 3,1865, allowed the Mint Director, with the Secretarys approval, to place the motto on all gold and silver coins that shall admit the inscription thereon. In 1873, Congress passed the Coinage Act, granting that the Secretary of the Treasury may cause the motto IN GOD WE TRUST to be inscribed on coins as shall admit of such motto. The use of In God We Trust has been interrupted, the motto disappeared from the five-cent coin in 1883, and did not reappear until production of the Jefferson nickel began in 1938. However, at least two other coins minted in every year in the interim still bore the motto, including the Morgan dollar, in 1908, Congress made it mandatory that the phrase be printed on all coins upon which it had previously appeared. Ocean Grove is an unincorporated community and census-designated place located within Neptune Township, Monmouth County, New Jersey, United States. It had a population of 3,342 at the 2010 United States Census and it is located on the Atlantic Oceans Jersey Shore, between Asbury Park to the north and Bradley Beach to the south. Listed on the National Register of Historic Places, Ocean Grove is noted for its abundant examples of Victorian architecture, Ocean Grove was founded in 1869 as an outgrowth of the camp meeting movement in the United States, when a group of Methodist clergymen, led by William B. Osborn and Ellwood H. Stokes, formed the Ocean Grove Camp Meeting Association to develop, by the early 20th century, the popular Christian meeting ground became known as the Queen of Religious Resorts. The communitys land is owned by the camp meeting association and leased to individual homeowners. 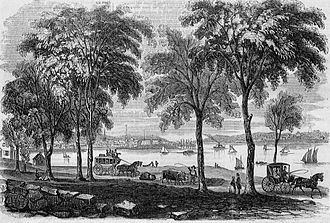 Ocean Grove remains the longest-active camp meeting site in the United States, on July 31,1869, Reverend W. B. About twenty tents were pitched that summer, by the following year paths were being graded, lots were sold, and plans were set in motion for a new town. In the summer of 1870, near the site of the first tabernacle and it was named the Beersheba well, for an ancient well in Palestine mentioned in the Bible, and is still in existence. Drawing from the population centers of New York City and Philadelphia. Tents and a wooden shelter, or tabernacle, were erected in the 1870s, for the trainloads of visitors arriving by the New York. In 1877 alone,710,000 railroad tickets were sold for the Ocean Grove-Asbury Park train station, a second, larger tabernacle was built in the 1880s, and permanent structures began to be constructed. Streets were paved and some were given Biblical names, such as Pilgrim Pathway, as Ocean Grove drew more and more visitors, the second tabernacle was outgrown, and construction of the present Great Auditorium was completed in 1894. Originally designed to accommodate crowds of as many as 10,000 people and it remains Ocean Groves most prominent structure and the centerpiece of its summer programs. 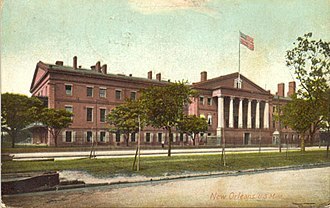 The New Orleans Mint operated in New Orleans, Louisiana, as a branch mint of the United States Mint from 1838 to 1861 and from 1879 to 1909. During its years of operation, it produced over 427 million gold and silver coins of nearly every American denomination and it was closed during most of the American Civil War and Reconstruction. After it was decommissioned as a mint, the building has served a variety of purposes, including as an office, a United States Coast Guard storage facility. Since 1981 it has served as a branch of the Louisiana State Museum, damaged by Hurricane Katrina in 2005, after over two years of repairs and renovations, the museum reopened in October 2007. As of April 2015, the museums exhibits include instruments used by some of New Orleans notable jazz musicians and posters. The site is a venue for jazz concerts, in partnership with the New Orleans Jazz National Historical Park. The Louisiana Historical Center is located on the floor of the building. The center includes collections of manuscripts and maps, and primary and secondary source materials in a wide range of media. It is open to anyone with an interest in Louisiana history, the New Orleans Mint has been designated a National Historic Landmark, and it is the oldest extant structure to have served as a U. S. Mint. Along with the Charlotte Mint, it is one of two former mint facilities in the U. S. to house an art gallery, the rapidly growing United States in the early 1830s experienced a shortage of coins. It is estimated that in 1830 there was one small silver coin per person, production of silver dollars was suspended in 1804 because they were being exchanged for underweight Spanish coins in the West Indies. That left the half-dollar as the largest denomination of circulating coin being minted in the U. S, foreign coins were being circulated in the U. S. to alleviate the shortage. The Philadelphia Mint had been the only U. S. mint until 1838, in 1836 Jackson had issued an executive order called the Specie Circular which demanded that all land transactions in the United States be conducted in cash. Both of these actions, combined with the depression following the Panic of 1837 increased the domestic need for minted money. The eagle is a base-unit of denomination issued only for gold coinage by the United States Mint based on the original values designated by the Coinage Act of 1792. It has been obsolete as a circulating denomination since 1933, the eagle was the largest of the four main decimal base-units of denomination used for circulating coinage in the United States prior to 1933, the year when gold was withdrawn from circulation. These four main base-units of denomination were the cent, the dime, the dollar, and the eagle, where a dime is 10 cents, a dollar is 10 dimes, and an eagle is 10 dollars. The eagle base-unit of denomination served as the basis of the gold quarter-eagle, the gold half-eagle, the eagle, in this regard the United States followed long-standing European practice of different base-unit denominations for different precious and semi-precious metals. In the United States, the cent was the base-unit of denomination in copper, the dime and dollar were the base-units of denomination in silver. 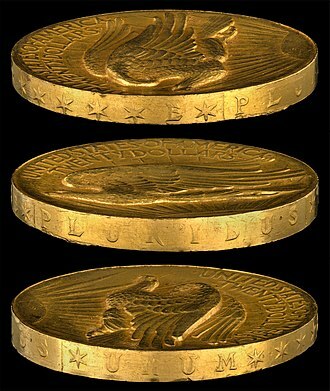 The eagle was the base-unit of denomination in gold although, unlike cent, thus, a double eagle showed its value as twenty dollars rather than two eagles. The diameter of eagles was 27 mm, half eagles 21 mm, quarter eagles 17 mm, originally the purity of all circulating gold coins in the United States was eleven twelfths pure gold and one twelfth alloy. Under U. S. law, the alloy was composed only of silver and copper, thus, U. S. gold coins had 22/24 pure gold, at most 1/24 silver, with the remaining one–two 24ths copper. The weight of circulating, standard gold, eagles was set at 270 grains, half eagles at 135 grains and this resulted in the eagle containing 0.5156 troy ounces of pure gold. S gold coins. As a result, the specification for standard gold was lowered from 22 karat to.8992 fine. In 1837 a small change in the fineness of the gold was made, the new 1837 standard for the eagle was 258 grains of.900 fine gold, with other coins proportionately sized. 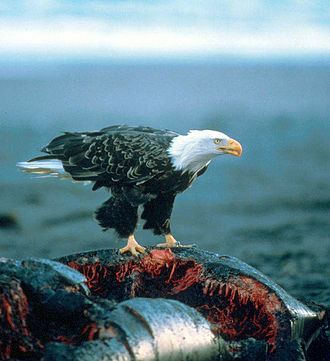 Between 1838 and 1840, the content was reduced to zero—the eagle in 1838, half eagle in 1839. 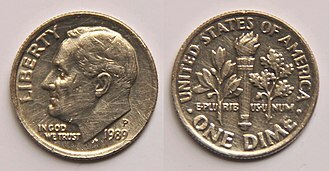 The dime, in U. S. usage, is a ten-cent coin, one tenth of a United States dollar, labeled formally as one dime. The denomination was first authorized by the Coinage Act of 1792, the dime is the smallest in diameter and is the thinnest of all U. S. coins currently minted for circulation, being.705 inches in diameter and.053 inches in thickness. The obverse of the coin depicts the profile of President Franklin D. Roosevelt and the reverse boasts an olive branch, a torch, as of 2011, the dime coin cost 5.65 cents to produce. The word dime comes from the French word dîme, meaning tithe or tenth part, from the Latin decima. In the past prices have occasionally been quoted on signage and other materials in terms of dimes, abbreviated as d or a d with a slash through it as with the cent. The Coinage Act of 1792 established the dime and mill as subdivisions of the equal to 1⁄10. The first known proposal for a coinage system in the United States was made in 1783 by Thomas Jefferson, Benjamin Franklin, Alexander Hamilton. 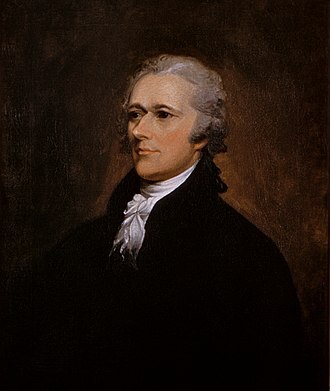 Hamilton, the nations first Secretary of the Treasury, recommended the issuance of six such coins in 1791, among the six was a silver coin, which shall be, in weight and value, one tenth part of a silver unit or dollar. Thus dimes are made small and thin, with the passage of the Coinage Act of 1965, the dimes silver content was removed. Dimes from 1965 to the present are composed of layers of 75 percent copper and 25 percent nickel. Starting in 1992, the U. S. Mint began issuing Silver Proof Sets annually and these sets are intended solely for collectors, and are not meant for general circulation. Since its introduction in 1796, the dime has been issued in six different major types, the name for each type indicates the design on the coins obverse. The composition of the disme was set at 89.24 percent silver and 10.76 percent copper, in 1792, a limited number of dismes were minted but never circulated. Some of these were struck in copper, indicating that the 1792 dismes were in fact pattern coins, the first dimes minted for circulation did not appear until 1796, due to a lack of demand for the coin and production problems at the United States Mint. Augustus Saint-Gaudens was an American sculptor of the Beaux-Arts generation who most embodied the ideals of the American Renaissance. In his years he founded the Cornish Colony, a colony that included notable painters, writers. His brother Louis Saint-Gaudens was a sculptor with whom he occasionally collaborated. Born in Dublin to a French father and an Irish mother, Saint-Gaudens was raised in New York, in 1861, he became an apprentice to a cameo-cutter, Louis Avet, and took evening art classes at the Cooper Union. Two years later, he was hired as an apprentice of Jules Le Brethon, another cameo cutter, at age 19, his apprenticeship completed and he traveled to Paris in 1867, where he studied in the atelier of François Jouffroy at the École des Beaux-Arts. In 1870, he left Paris for Rome, to art and architecture. Pierrepont, a phrenologist, proved to be a demanding client insisting that Saint-Gaudens make his head larger, in 1876, he won a commission for a bronze David Farragut Memorial. 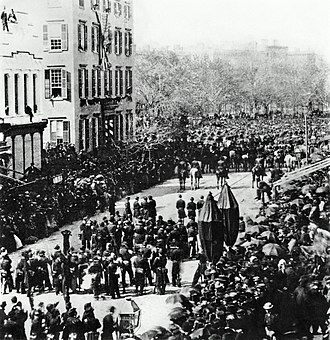 He rented a studio at 49 rue Notre Dame des Champs and it was unveiled on May 25,1881, in Madison Square Park. The statue stood on a 300-foot-high tower, making Diana the highest point in the city and it was the first statue in that part of Manhattan to be lit at night by electricity. The statue and its tower was a landmark until 1925 when the building was demolished, in New York, he was a member of the Tilers, a group of prominent artists and writers, including Winslow Homer, William Merritt Chase and Arthur Quartley. He was a member of the Salmagundi Club in New York, two grand equestrian monuments to Civil War generals are outstanding, to General John A. For the Lincoln Centennial in 1909, Saint-Gaudens produced another statue of the president, a seated figure, Abraham Lincoln, The Head of State, is in Chicagos Grant Park. Saint-Gaudens completed the work and had begun casting the statue at the time of his death—his workshop completed it. The statues head was used as the model for the postage stamp issued on the 100th anniversary of Lincolns birth. Saint-Gaudens created the statue for the monument of Charles Stewart Parnell, with minor modifications, this medallion was reproduced for the Stevenson memorial in St.
William Sturgis Bigelow was an American physician and collector of Japanese art. He was one of the first Americans to live in Japan, a brilliant medical student, Bigelow received his degree in medicine from Harvard University in 1874, and continued his medical studies in Europe for five years, under Louis Pasteur. Though his primary interest was, bacteriology, his father was a surgeon, in 1882, Bigelow traveled to Japan with Ernest Fenollosa and Edward Sylvester Morse. This may have been intended originally as simply a vacation from the world of medicine, there, he became an art collector, and traveled the country for some time, exploring it and studying its culture and religion. Bigelow would eventually convert to Buddhism and he contributed financially to the establishment of the Nihon Bijutsuin, which was founded by his friend and ofttimes traveling companion Okakura Kakuzō. A photographer, Bigelow recorded many of the sights he and his companions came across, returning to the United States, Bigelow donated over 40,000 objects of Japanese art to the Museum of Fine Arts, Boston. He was elected a Fellow of the American Academy of Arts and he was considered at once an epicure and a mystic, who professed an ascetic religion and wore beautiful Charvet haberdashery. She rejected the proposal but from on their relationship became more intimate, during their relationship, he gave her a number of Japanese objects which she donated in 1930 to the Etnografski Muzej in Zagreb. Bigelow was the man who introduced Baron Kaneko Kentarō to Theodore Roosevelt by a letter of introduction. 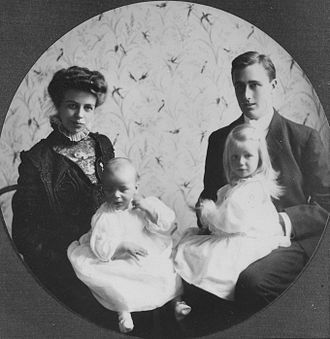 They first met in 1890 when Roosevelt was Head of the Civil Service Commission and he accepted the existence of both material and spiritual realms, many of his ideas were discussed in his book Buddhism and Immortality. Bigelow used the concept of selection as a mechanism for evolution. According to Bigelow spiritual evolution is when an individual emerges from unconditioned consciousness, next the individual moves to a level of celestial experience, and finally is able to return to the unconditioned consciousness from which all things emerge. The United States Mint produces circulating coinage for the United States to conduct its trade and commerce, as well as controlling the movement of bullion. It does not produce paper money, the Mint was created in Philadelphia in 1792, and soon joined by other centres, whose coins were identified by their own mint marks. There are currently four active coin-producing mints, Denver, San Francisco, the Mint was created by Congress with the Coinage Act of 1792, and originally placed within the Department of State. Per the terms of the Coinage Act, the first Mint building was in Philadelphia, the capital of the United States, the Mints headquarters are in Washington D. C. It operates mint facilities in Philadelphia, San Francisco, and West Point, New York and a bullion depository at Fort Knox, Kentucky. Official Mints were once located in Carson City, Charlotte, North Carolina, Georgia, New Orleans, Washington, D. C. and even in Manila. Originally part of the State Department, the Mint was made an independent agency in 1799 and it converted precious metals into standard coin for anyones account with no seigniorage charge beyond the refining costs. Under the Coinage Act of 1873, the Mint became part of the Department of the Treasury and it was placed under the auspices of the Treasurer of the United States in 1981. Legal tender coins of today are minted solely for the Treasurys account, the first Director of the United States Mint was renowned scientist David Rittenhouse from 1792 to 1795. 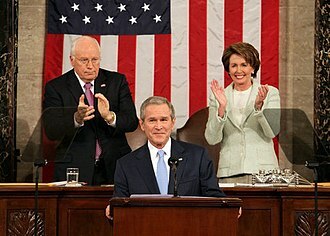 The position was held most recently by Edmund C, moy until his resignation effective January 9,2011. Henry Voigt was the first Superintendent and Chief Coiner, and is credited with some of the first U. S. coin designs. Another important position at the Mint is that of Chief Engraver, the Mint has operated several branch facilities throughout the United States since the Philadelphia Mint opened in 1792, in a building known as Ye Olde Mint. With the opening of branch mints came the need for mint marks, the first of these branch mints were the Charlotte, North Carolina, Dahlonega and New Orleans, Louisiana branches. Both the Charlotte and Dahlonega Mints were opened to facilitate the conversion of gold deposits into coinage. Third Philadelphia Mint (1901). Now Community College of Philadelphia. The Ionic-columned portico of the New Orleans Mint building's façade in June 2005, seen from across Esplanade Avenue. The trees along the street in front of the Mint have grown tall, such that it is very difficult to obtain a good photograph of the old mint's façade today. This photo from the Louisiana State Museum in the old U.S. Mint shows the original 1835 plans for the building by William Strickland. The Mint building retains this basic W-shaped design today. 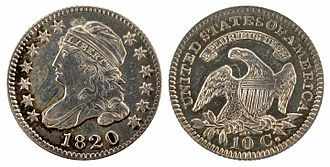 The 1848 "Liberty Head" quarter eagle punch-marked "CAL"
The 1822 Capped Head Half Eagle (large diameter) is one of only three known for the year. Portrait of Augustus's wife Augusta and their son, Homer Saint-Gaudens, by John Singer Sargent, 1890. 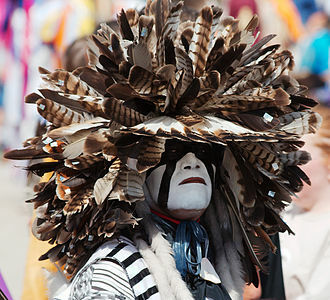 A modern-day Cheyenne dog soldier wearing a feathered headdress during a pow wow at the Indian Summer festival in Henry Maier Festival Park, Milwaukee, Wisconsin. 2008. The plaque of Roosevelt at the Recorder of Deeds Building in Washington, D.C. The First U.S. Branch Mint in California is located at 608–619 Commercial Street, San Francisco, San Francisco County. The branch opened on April 3, 1854. Today the building houses the Pacific Heritage Museum. Bigelow's grave at Homyoin temple.